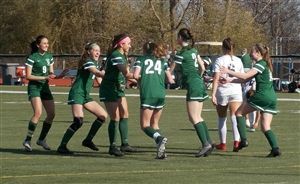 The Archmere girls' soccer team took on DMA, the defending Division II state champions, on Wednesday, March 27th at home. DMA had tied the game in the 65th minute and had sustained pressure through the afternoon, but "that changed in an instant" due to a last minute goal by Anna Garcia '21. Anna took a pass from Rebekah Kehoe '20 and chipped the ball over the Seahawks’ goalie to lift the Auks to the 2-1 win. "In the 74th minute, the Auks earned their fourth and final corner kick of the match. Gabrielle Witherell’s inbounds pass was cleared out of the 18-yard box by a Seahawks defender, but Rebekah Kehoe grabbed the loose ball about 35 yards out in front of the DMA bench. She sent a looping pass over the DMA defense, and Anna Garcia and Nicole Witherell broke through for a two-on-none opportunity. Garcia lifted the ball over Madison Lemanski for the decisive goal." The Auks outshot the Seahawks, 6-4, and both teams earned four corners. Archmere travels to Newark Charter on Tuesday. For pictures and game details, click here. Photo Courtesy of Mike Lang, "The Dialog"